@JayJayasuriya: Enjoy up to $50 in FREE ride credit with @Lyft on me! Enjoy up to $50 in FREE ride credit with @Lyft on me! Download Lyft for a friendly, affordable ride whenever you need one. Request a ride with the tap of a button, and get picked up by a reliable community driver within minutes. Yep, it’s that easy. See the Terms and Conditions for eligible markets and other restrictions. Promo codes are a great way to spread the word about the Lyft community. Here is an overview of how to apply a promo code as a passenger on the platform. Promo codes are for new passengers, unless otherwise specified. If you’re having trouble getting the app to accept your promo code, it may be because we don’t see you as a new passenger. Unless your code explicitly said otherwise, it was limited to new passengers. You’ve never requested a Lyft ride. You’ve never entered another promo code. Promo codes are entered directly into the app, or auto-applied through a link. 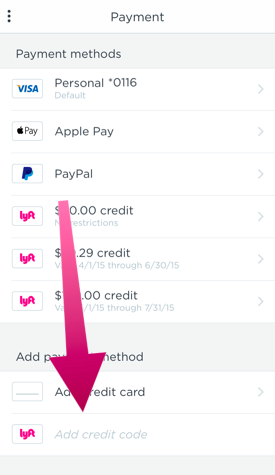 If you received a message with a link to sign up for Lyft, or clicked a friend’s link online, the code was automatically added to your app. When you finish signing up, check the ‘Payment’ tab — you should already see the code. If it’s not there, you can also enter it manually. The code is listed at the end of the referral link in all caps. To enter a promo code, open up your app and scroll to the bottom of the ‘Payment’ section to use the 'Add credit code’ box. After you enter it, you’ll see whether or not the code was accepted, its amount and expiration date, and any other terms. Your code may be for a specified number of discounted rides, or a full credit amount. The ‘Payment’ tab of your app has all the details for your code. Be sure to track the expiration date as well as the credit amount. Additional limits, such as regions or locations, will also be outlined there. Credit is applied automatically to qualifying rides. On the Payment screen after the ride, you can see the amount of credit applied or what's being charged to your card. If your credit isn’t applying automatically, you can tap on the payment method above the ride total to see your available options. It’s limited to a certain location. Some codes are good only in certain cities or for rides going to or from a specific location. You won’t be able to apply credit to rides which don’t qualify. You're already using another code. You cannot use more than one code per ride, but you can switch between codes on the Payment screen after the ride. It's expired. Most codes expire in a certain time frame. The expiration date and time are specified in the ‘Payment’ tab. We want your experience on the Lyft platform to be positive, and we’re happy to look into any issue you’re having with a promo code. The name and phone number on your Lyft account. The code you’re trying to apply. The ride you’re trying to apply it to (if any): name of the driver, date of the ride, and pickup and drop-off locations. The error message you’re getting (if any) and any text, dates, or times shown under the code in the 'Payment' tab. The original ride that started it all. Whether solo or with up to three friends, Lyft is your personal ride. Available nationwide. Our six-passenger ride for when you need more space or want to roll with all your friends. Available nationwide.